Featuring Brian Wilson, Mike Love, Al Jardine, Bruce Johnston, David Marks, Tony Asher, Karl Engemann, Mark Linett, Hal Blaine, Don Randi, Bruce Botnick, Helen Shapiro, Keith Altham, David WIld, Lucy O’Brien and archival footage of Dennis Wilson. Directed by Martin R. Smith and Matthew Longfellow. Distributed by Eagle Rock Home Entertainment. 91 minutes. Not Rated. The records explored in VH1’s long running Classic Albums series do not always quite live up to the designation “classic album.” Rush’s 2112? Frank Zappa’s Over-Nite Sensation? Simply Red’s Stars? Def Leppard’s Hysteria? Primal Scream’s Screamadelica? All of them had their moments, none were classic. Pet Sounds shows a band, and specifically a songwriter, hitting on all cylinders. As is standard with the series, the show gathers together as many original band members as possible, as well as studio musicians, co-writers, mixing men, fans, critics, etc. 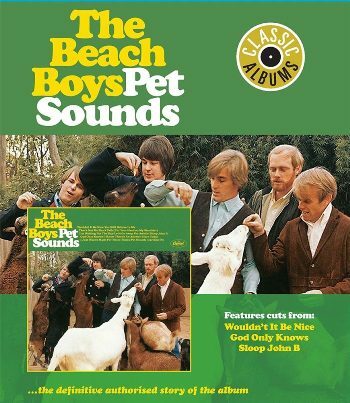 Classic Albums: Pet Sounds gets almost the entire band from that time: Brian Wilson, Mike Love, Al Jardine, Bruce Johnston and David Marks appear in interviews made specifically for the program. Late drummer Dennis Wilson, who drowned in 1983, is shown in an interview shortly before his death. Strangely, the other late Wilson brother and final band member Carl Wilson (who died of cancer in 1998) is not shown in any archival interviews. However, Pet Sounds was made long before all the legal wranglings – though some could say that the first seeds of discontent between Wilson and Love were sown about this point in the band’s history. The Classic Albums special starts, as they often do, with a brief breakdown of the road to get to Pet Sounds. The three Wilson Brothers (Brian, Carl and Dennis), their cousin (Mike Love) and two neighborhood friends (Al Jardine and David Marks) were put together as a group by the Wilsons’ father Murry, a frustrated singer himself. The special barely touches on the problems caused by the infamous Murry, who was spectacularly abusive and more than happy to cheat his sons at any chance. However, they started racking up the hits due to the blooming musical genius of main songwriter Brian, and a savvy appropriation of the hip surfing culture (none of the Beach Boys except for Dennis actually surfed, Brian could barely swim). By 1965 and 1996, when they started making Pet Sounds, things were changing for the band rapidly. First of all, there was a sea change in the music industry. The British Invasion had taken over, and suddenly the simple pop music of “Surfin’ USA” was a little quaint. Most of the musicians that the Beach Boys came up with – like Jan & Dean, Bobby Rydell, Neil Sedaka, The Four Seasons – were already considered pretty much has-beens. Brian Wilson was fascinated by the new depth and textures of the music, as demonstrated by the complex melodies of The Beatles, Phil Spector’s Wall of Sound and the songs of Burt Bacharach and Hal David. Brian, who was afflicted with terrible stage fright, decided that he would prefer to let the rest of the guys go out and tour, while he would stay home and work on the Beach Boys albums. The band hired Bruce Johnston to take his place on tour, and Wilson started recording with the legendary studio musicians known as The Wrecking Crew. Despite being musicians themselves, the other members of the Beach Boys did almost no instrumental work on Pet Sounds, they just were called in to record the complex harmonies. Legend is that Love in particular did not take that well, though here he is speaking glowingly of the album, which has made his band’s reputation and probably grabbed him a good chunk of cash over the years. Of course, despite the record’s legendary reputation, Mike Love was the businessman of the group, not the artist. “It took twenty years to go platinum,” Love complains here. Add to that the fact that the record label, though very supportive of the band and particularly Brian Wilson, were worried that as great as the album may be, it was not as obviously commercial as The Beach Boys’ previous work. They didn’t see much in the way of radio singles, so they did not push the album as hard as they may have. Fifty years on from the recording, there is no argument left. Pet Sounds is a CLASSIC ALBUM in all caps. This intriguing look back at the recording is necessary viewing. Copyright ©2016 PopEntertainment.com. All rights reserved. Posted: October 21, 2016. Tags: Al Jardine, Bobby Rydell, brian wilson, Bruce Botnick, Bruce Johnston, burt bacharach, Carl Wilson, Caroline No, Classic Albums, David Marks, David Wild, Dennis Wilson, Don Randi, God Only Knows, Good Vibrations, Hal Blaine, Hal David, Helen Shapiro, I Wasn't Made For These Times, Jan & Dean, jay s jacobs, Karl Engemann, Keith Altham, Lucy O’Brien, Mark Linett, Mike Love, Murry Wilson, music video, Music Video Review, Neil Sedaka, paul mccartney, Pet Sounds, Phil Spector, PopEntertainment.com, Sgt. Pepper's Lonely Hearts Club Band, Sloop John B, The Beach Boys, the beatles, The Four Seasons, The Wall of Sound, Tony Asher, VH1, Wouldn't It Be Nice. Bookmark the permalink.